Does it seem strange that you are persecuted, but many other believers are not? Why are some never persecuted for their faith? When some new believers come to saving faith in Christ, they’re sometimes a bit surprised by being persecuted, but it really shouldn’t surprise them. 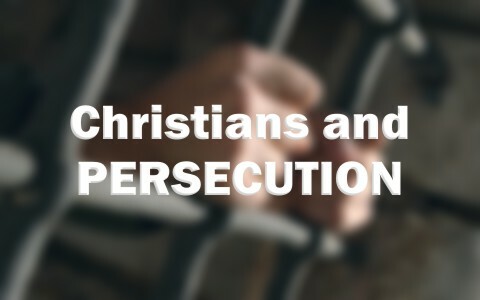 What is surprising is if a believer never suffered persecution, so if someone is a believer, but they’ve never suffered persecution, then something’s clearly wrong, because “all who desire to live a godly life in Christ Jesus will be persecuted” (2nd Tim 3:12). Paul himself was “persecuted, but not forsaken; struck down, but not destroyed” (2nd Cor 4:9). Paul was on the front lines of the church’s missionary work so he saw a great deal of persecution. In fact, he was a former persecutor of the way (Acts 22:4), but the persecution of God’s people has been going on for a very long time as even the psalmist wrote, “Greatly have they afflicted me from my youth, yet they have not prevailed against me” (Psalm 129:2), so don’t think you’re ever alone if you suffer persecution for your faith, but you may be more alone than you think if you have never even once been persecuted for your faith. Paul said all who live a godly life will be persecuted, so either the person is not living a godly life or they are secret, underground believers who are fearful of man. Let me say that there are places in the world where they must worship underground, but that’s not what we mean here. Paul was not ashamed of the gospel (Rom 1:16), so Paul was persecuted perhaps more than any of the other apostles, but there are blessings with persecution, but there should be persecution…at least some, or it would really be surprising because we’re told all believers will suffer persecution. Jesus didn’t see persecution as a bad thing at all. In fact, I think it shows which side you’re on. Jesus said, “Blessed are those who are persecuted for righteousness’ sake, for theirs is the kingdom of heaven” (Matt 5:10), and “Blessed are you when others revile you and persecute you and utter all kinds of evil against you falsely on my account” (Matt 5:11). It’s on account of Jesus’ name that the believer suffers persecution. When Jesus asked Saul why he was persecuting Him, Saul didn’t understand that by persecuting the Body of Christ, the church, he was persecuting Christ Himself (Acts 9:4-5). But even that persecution was good because it spread the faith throughout the Roman Empire (Acts 8:1)! The Apostle Peter tells us we should “rejoice insofar as you share Christ’s sufferings, that you may also rejoice and be glad when his glory is revealed. If you are insulted for the name of Christ, you are blessed, because the Spirit of glory and of God rests upon you” (1st Pet 4:13-14). Now who doesn’t want the spirit of the glory of God resting upon them? I do, but it comes with a price! You must humble yourselves, recognizing that Jesus died for us while we were still God’s enemies (Rom 5:10), so your persecutors will be a means of blessings, that is if you don’t respond in kind. True humility will allow you to receive the true blessings of persecution, so the next time your persecuted for your faith, “Rejoice and be glad, for your reward is great in heaven, for so they persecuted the prophets who were before you” (Matt 5:12). We should keep our brothers and sisters in Christ in prayer around the world, because for some, “they will deliver you up to tribulation and put you to death, and you will be hated by all nations for my name’s sake” (Matt 24:9). Never expect a friendly, open, and welcoming reception when you mention Jesus. Late in Jesus’ ministry, many of His followers were so offended that most of them stopped following Him (John 6:66). We never should be pushing our faith on others, or as one person put it, “Stop cramming your religion down my throat.” Jesus never pushed Himself on anyone, nor did He ever insist on someone immediately trusting in Him against their own will. If we are obnoxious Christians, always trying to force the issue, then we will have few people with whom to share the gospel. When people start avoiding someone, it’s not persecution, but they’re avoiding being around that person. No one wants something forced on them, and Christ is not to be forcefully pushed on anyone. God draws people to Christ (John 6:44), and one of the most powerful things we can do is to love one another, just as Christ loved His disciples (and us). This is how everyone will know we are real disciples of Christ (John 13:34-35), but with the absence of love in our lives, they might finished with hearing about Jesus. Sadly, some unbelievers have seen enough to be convinced that they want no part of God. We must respect that. One thing about persecution; it comes in many forms. When someone gets promoted ahead of someone who is more qualified and experienced, but they’re a Christian, it might be persecution. It could be real or imagined, but the persecution most people in the West experience is from those who just want to shut out God from everything. They want Him out of the public square, government, schools, TV, movies, and just about everywhere else people are, however that pales in comparison to what some endure. Our brothers and sisters who live in places where Christianity is hated or illegal, suffer a great deal of persecution, but then, they also get a great deal of blessings, and can you imagine, some of these believer’s rewards awaiting them in heaven? If you have never been persecuted once, take the time to ask yourself why. Does your immediate family know? Do you alone worship with the Body of Christ, the church? Are there few believers in your network, like extended family, friends, and co-workers? Are you sometimes a “damper” at an office or holiday party or other gatherings? Do you hear the room grow quiet when you walk into the breakroom? Have you had people apologize for using a bad joke or swear word in your presence? If so, then you have very convincing evidence that you’re a Christian. We know if there’s not much persecution, there’s not much blessing from it. Now, if you want to change that, try talking to your family, friends, and co-workers about Christ. See what happens. I would imagine you’re going to get a lot more persecution, but that’s okay. That means you can have the spirit of the glory of God resting on you. You can have blessings bestowed upon you, and that means you should leap for joy because you and the prophets are in good company, “for so they persecuted the prophets who were before you” (Matt 5:12b). Previous post: What Does God Say About Serving Others? Next post: How Can Christians Fight Racial Prejudice?